Regency Contract, Prestige Collection, Dimensions: 72"W x 24"D x 29"H. Weight: 278 lbs. Construction: Walnut wood veneer with a rich mahogany finish. Drawers: Two utility, three file drawers (lockable). Wire management holes: One. Fully finished on all sides. Ships with some assembly required. 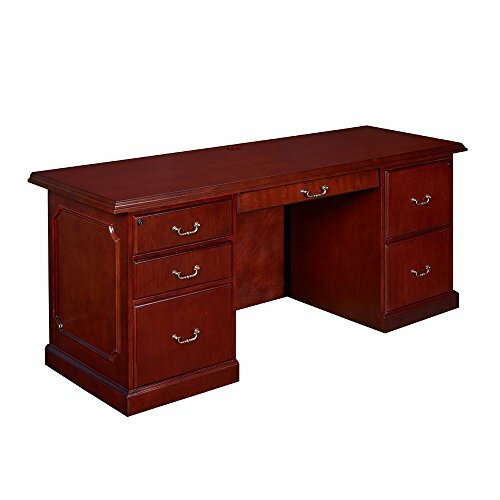 Part of the Prestige collection, this 72"W credenza features classic lines, wood trim and elegant edge detailing--the perfect complement to any office or home work space. Constructed with beautiful walnut veneers in a rich mahogany finish, this credenza has brass tone metal hardware and a solid wood beveled edge trim for a professional appearance and an attractive traditional look. The Prestige credenza comes with full-sized drawer pedestals (both locking). The right pedestal has two utility drawers and one file drawer, and the left pedestal has two file drawers. All drawers can be fully extended for better access to contents, and the file drawers can support letter and legal-sized hanging files. One grommet hole in the far center of the top work surface provides ample room for cable management. Ships with some assembly required. If you have any questions about this product by Regency Contract, contact us by completing and submitting the form below. If you are looking for a specif part number, please include it with your message.